Dmitrii Kovtyulev was born in Boidolovo on 7 November 1918. He joined the Red Army in 1939. In 1939-1940, he took part in the Soviet-Finnish Winter War. In June 1941, Mladshii Leitenant Kovtyulev served in 91 IAP, flying I-153s with this unit. On 3 July, the I-153s from 91 IAP clashed with Bf 109s. Mladshii Leitenant Konstantin Pavlov claimed four shared Bf 109s over Shepetivka together with five other pilots. One of the shared was also credited to Mladshii Leitenant Kovtyulev. Mladshii Leitenant Kovtyulev also claimed an additional Bf 109 as his second victory. On 24 July, Mladshii Leitenant Kovtyulev and Mladshii Leitenant Konstantin Pavlov claimed a shared He 113 (probably a Bf 109) together with five other pilots. He was posted to 20 IAP in July 1941, continuing flying I-153s with this unit. He left 20 IAP on 5 September 1941. On 20 January 1942, he was posted to 518 IAP, flying Yak-1 with this unit. In a dogfight against ten Bf 109s on 15 February, Starshii Leitenant Kovtyulev, CO 1./518 IAP, first claimed one of them shot down before being shot down and severely wounded. It is possible that they had been in combat with the Bf 109Fs of II./JG 51 since they are the only Luftwaffe unit claiming fighters on the eastern front on this date when Leutnant Herbert Puschmann of 4./JG 51 claimed two ‘I-61s’ at 12:47. This unit was at the time based at Bryansk. Kovtyulev didn’t take part in any active flying after this combat. After a long treatment for his injuries he became adjutant of 2./91 IAP. He was decorated with the Gold Star of the Soviet Union (no. 825) and the Order of Lenin on 30 January 1943. 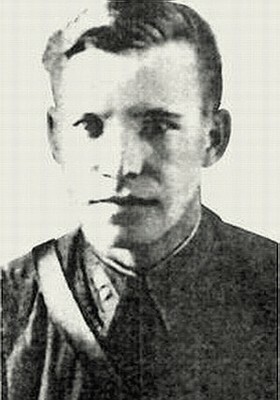 Due to health reasons, Kapitan Kovtyulev was dismissed from active service in February 1944 and placed in the Reserve. Kovtyulev ended the war with 4 biplane victories and a total of 5. These had been claimed during 141 combat missions and 44 air combats. Kovtyulev died on 1 December 1945 and he is buried in Nevel. Biplane victories: 4 and 6 shared destroyed. TOTAL: 5 and 6 shared destroyed. (a) Possibly claimed in combat with II./JG 51.